Nocardia is an opportunistic pathogen which most commonly affects immunocompromised hosts. The predisposing factors are prolonged corticosteroid therapy, malignancies, organ transplantation, chronic lung disease, alcoholism, and diabetes mellitus., Dissemination to the central nervous system (CNS), cutaneous or subcutaneous tissue, joints, bones, eyes, kidney, and heart is the progression of the pulmonary involvement. Disseminated infections occur particularly in immunosuppressed hosts and are most often due to Nocardia farcinica, Nocardia nova, and Nocardia cyriacigeorgica. Here, we report an unusual case of disseminated N. farcinica infection presenting as a paravertebral abscess in a patient with systemic lupus erythematosus (SLE). A 24-year-old male with SLE presented with a 2-week history of low back pain. He was immunosuppressed with methylprednisolone 32 mg/day and mycophenolate mofetil (MMF) 2 g/day. When low back pain aggravated, he visited another hospital. The lumbar magnetic resonance imaging (MRI) revealed a 5.5 cm × 6 cm × 20 cm paravertebral abscess at Th11-L5. He had been operated for abscess evacuation and postoperative intravenous antibiotic therapy was initiated with ampicillin-sulbactam and amikacin. On the 2nd postoperative day, he was referred to our department for the evaluation and treatment of paravertebral abscess. On admission, his body temperature was 36.2°C, blood pressure was 120/80 mmHg, heart rate was 70 beats/min, and respiration rate was 18 breaths/min. Auscultation of the lung showed clear lung sound without rhonchus or rale. There was no tenderness in the lower back. Findings from neurological examinations were normal. 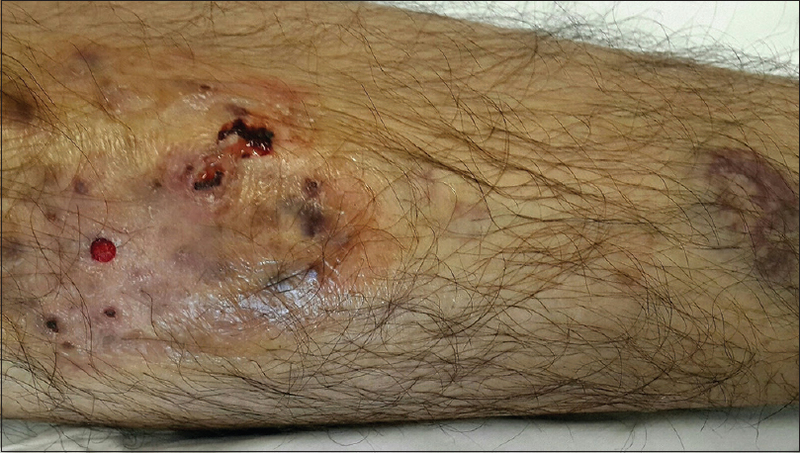 There was an erythematous plaque with papules on the right knee and an ecchymotic area below it [Figure 1]. The initial peripheral blood count revealed a white blood cell count of 18,200/mm3 (neutrophils 97.3%, lymphocytes 1.5%, and monocytes 1.2%), hemoglobin level of 10.4 g/dL, platelet count of 392,000/mm3, erythrocyte sedimentation rate of 72 mm/h, and C-reactive protein of 193 mg/L. Blood chemistry revealed a total protein level of 4.5 g/dL, albumin level of 2.3 g/dL, aspartate aminotransferase/alanine aminotransferase of 61/65 U/L, alkaline phosphatase of 82 IU/L, and blood urea nitrogen/creatinine of 36.4/1.14 mg/dL. An empiric antibiotic treatment was started with piperacillin-tazobactam and clindamycin. Multiple nodules were seen on chest radiograph. Chest computed tomography (CT) showed mildly enlarged lymph nodes, bilateral pleural effusion, right-sided empyema, and multiple bilateral nodules, some of which presented cavitation. Although there were no neurological findings, an MRI of the brain was requested to look for cerebral involvement. MRI showed peripherally enhancing lesions in the left cerebellar hemisphere, right frontal region, and left parietal region with restricted diffusion. Fundus examination revealed bilateral macular infiltration. A punch biopsy was obtained from the lesion on the right knee [Figure 1]. Histopathological examination of skin biopsy revealed a dermal infiltration of histiocytoid cells staining positively for CD68, pointing toward granulomatous disease. The paravertebral abscess was drained. Gram stain of the evacuated pus revealed Gram-positive filamentous bacilli with branching. The isolated strain was subjected to 16S rRNA sequence analysis that showed 100% match with N. farcinica 16S rRNA sequence. The result of antimicrobial susceptibility testing showed the isolate susceptible to linezolid, imipenem, ciprofloxacin, and trimethoprim-sulfamethoxazole (TMP-SMX). Initial antimicrobial therapy was switched to intravenous linezolid (600 mg bid), imipenem (500 mg qid), and amikacin (1 g qd) according to the antimicrobial susceptibility patterns of N. farcinica. Methylprednisolone was reduced to 4 mg by titration and MMF was discontinued. Lumbar MR and chest CT were repeated during the 3rd week of treatment, which showed substantial resolution of the previously detected lesions. The patient was discharged with TMP-SMX and amikacin 6 weeks after admission. We planned a maintenance regimen of TMP-SMX treatment as long as immunosuppressive therapy continued. Nocardia species are aerobic, catalase-positive, weakly acid-fast, fine right-angled branching filamentous Gram-positive bacteria belonging to Actinomycetales. They are saprophytic bacteria which live in carbon-rich sources such as soil, decomposing organic matter, and aquatic environment. There are more than ninety Nocardia species, many of which have been suspected of human disease. N. farcinica is an important member of Nocardia asteroides complex., The number of N. farcinica infections is increasing due to both the growing population of immunosuppressed hosts and improved techniques for the identification of the bacteria. Successful treatment of paraspinal abscess as a part of disseminated nocardiosis requires appropriate antibiotic therapy and drainage of the abscess. Using three-drug regimen comprising of susceptible antibiotics for long term is recommended. Patterns of antimicrobial susceptibility have varied among Nocardia species. Unless TMP-SMX is the favored treatment for nocardiosis, N. farcinica shows a high rate resistance to TMP-SMX and optimal antibiotic treatment should be decided by antimicrobial susceptibility testing. It is generally susceptible to minocycline, amikacin, moxifloxacin, and imipenem. In addition, linezolid is an additional option for the treatment of N. farcinica infection that show good activity against all the Nocardia species. Antibiotic treatment must be started intravenously and can be changed after 3–6 weeks by oral regimen due to clinical and radiological responses. Therapy has to be continued for 12 months if the CNS is involved. Furthermore, tracing patients for at least 1 year to detect late relapses is recommended. Clinical course in N. farcinica infection is potentially lethal because of its high resistance to antibiotics and its tendency to disseminate. Empirical monotherapy with TMP-SMX may not be sufficient because of the specific drug pattern of N. farcinica, so that using a combination regimen of imipenem and amikacin may be a more likely initial treatment for nocardiosis. Wilson JW. Nocardiosis: Updates and clinical overview. Mayo Clin Proc 2012;87:403-7. Crossley KB, Peterson PK. Nocardia species: Origin. In: Mandell GL, Bennett JE, Dolin R, editors. Principles and Practice in Infectious Diseases. 8th ed., Vol. 1. New York: Churchill Livingstone; 2015. p. 3830-41. Park SD, Kim HJ, Jang IH, Uh Y, Kim J, Yoon KJ, et al. First report of Nocardia farcinica bursitis in a patient with diabetes mellitus. Ann Lab Med 2014;34:252-5. Goodfellow M, Williams ST. Ecology of actinomycetes. Ann Rev Microbiol 1983;37:189-216. Coussement J, Lebeaux D, van Delden C, Guillot H, Freund R, Marbus S, et al. Nocardia infection in solid organ transplant recipients: A multicenter European case-control study. Clin Infect Dis 2016;63:338-45. Roth A, Andrees S, Kroppenstedt RM, Harmsen D, Mauch H. Phylogeny of the genus Nocardia based on reassessed 16S rRNA gene sequences reveals underspeciation and division of strains classified as Nocardia asteroides into three established species and two unnamed taxons. J Clin Microbiol 2003;41:851-6. Filice GA. Nocardiosis. In: Niederman MS, Sarosi GA, Glassroth J, editors. Respiratory İnfections. 2nd ed. Philadelphia: Lippincott Williams and Wilkins; 2001. p. 457-66. Pelaez AI, Garcia-Suarez Mdel M, Manteca A, Melon O, Aranaz C, Cimadevilla R, et al. Afatal case of Nocardia otitidiscaviarum pulmonary infection and brain abscess: Taxonomic characterization by molecular techniques. Ann Clin Microbiol Antimicrob 2009;8:11. Uhde KB, Pathak S, McCullum I Jr., Jannat-Khah DP, Shadomy SV, Dykewicz CA, et al. Antimicrobial-resistant Nocardia isolates, United States, 1995-2004. Clin Infect Dis 2010;51:1445-8. Byrne E, Brophy BP, Perrett LV. Nocardia cerebral abscess: New concepts in diagnosis, management, and prognosis. J Neurol Neurosurg Psychiatry 1979;42:1038-45. Geiseler PJ, Andersen BR. Results of therapy in systemic nocardiosis. Am J Med Sci 1979;278:188-94.